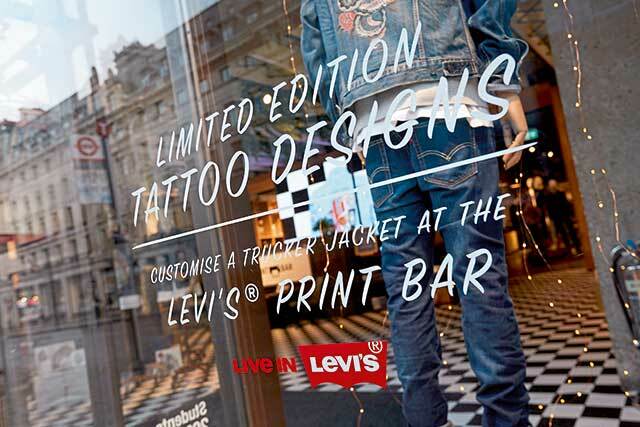 The flagship Levi’s store on Regent’s Street in London is a must-visit destination for tourists and London shoppers alike. 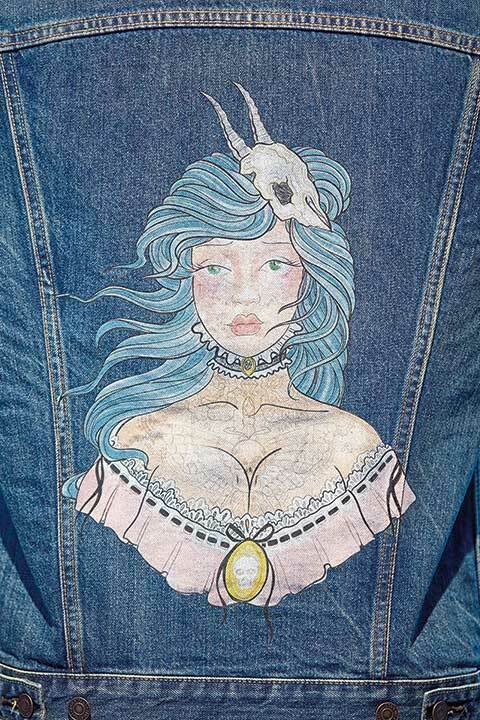 In December 2017, the renowned denim brand gave consumers even more reason to visit through an inspired collaboration with live printing company YR to celebrate the 50th anniversary of the iconic Levi’s Trucker Jacket. 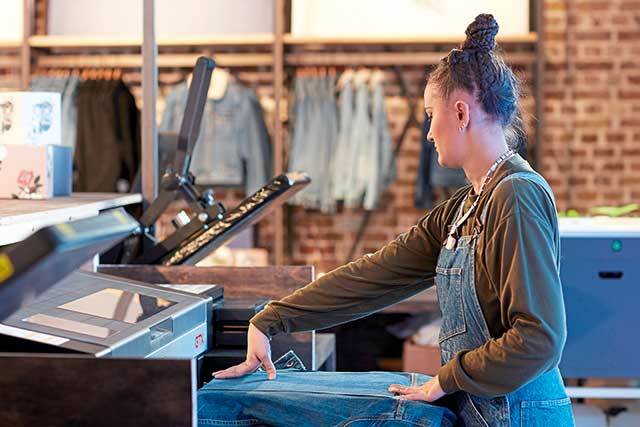 Like any leading brand, Levi’s knows that, with online shopping sales increasing, there is a growing pressure on bricks and mortar fashion stores to sell customers more than just clothes on rails; they today’s customer wants an experience to go with their printed and embroidered products. Hence the involvement of YR – creating memorable experiences is what the company is all about. 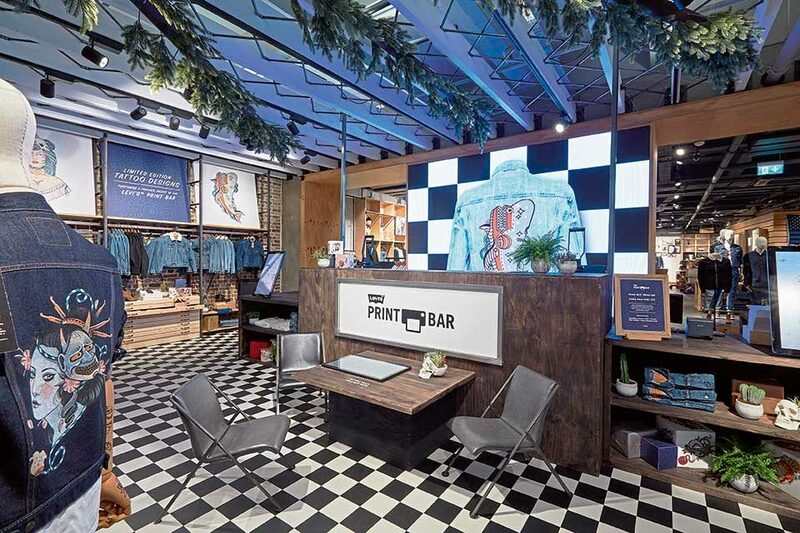 Tim and Tom soon realised the appeal to customers of graffiti tees that were printed from the digital graffiti wall and so created YR Store in 2013, a pop-up custom T-shirt design and print shop just off London’s Carnaby Street. 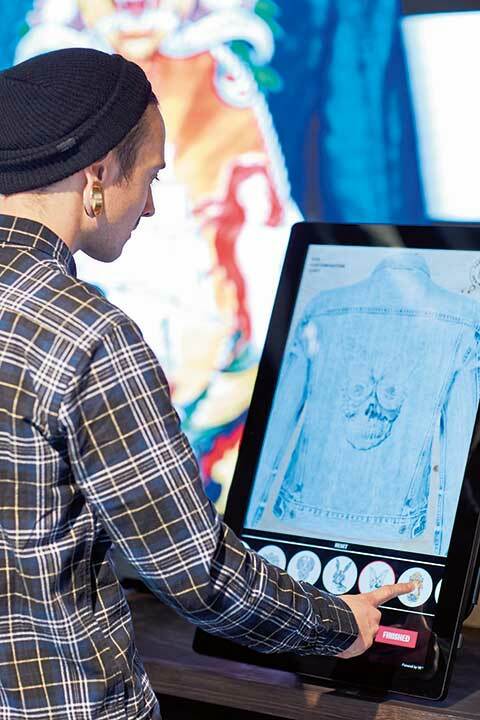 The concept of being able to customise a T-shirt on a screen and then watch it being printed live took off, reports YR’s head of sales, Anton Weiss, and led to other YR Stores being set up in retail shops such as Nike, Topshop, Selfridges and Liberty. The company’s events background also led it to establish YR Live, an agency that arranges live design and print events, from one-off days using ‘plug and play’ equipment to arranging lengthy campaigns complete with trained staff, post-event analysis and custom software. Numerous well-known brands have collaborated with YR Live on events, including Google, Toyota, Adidas and Facebook, explains Anton. “We do lots of big events: Mobile World Congress, Google Beach at Cannes Lions, Geneva Car Show, the World Cup in Rio… The Rio Games with Coca-Cola wasn’t a huge activation, but we had just two weeks to make it happen and getting equipment and consumables in and out of Rio proved to be a very interesting exercise indeed! Three years ago YR started using DTG. 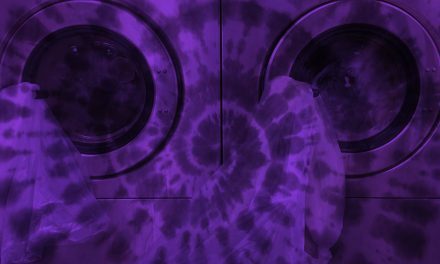 “There are some clear advantages to DTG [compared with dye sublimation], such as printing white and printing onto black tees. Bold white on black tees is a strong look and popular at the moment with consumers. 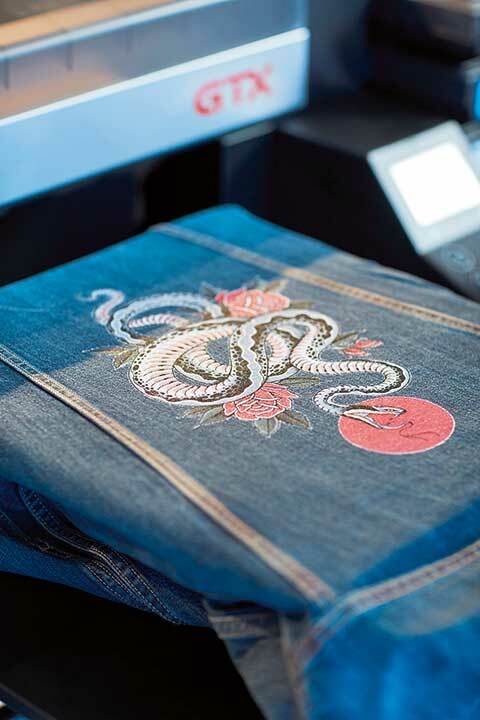 DTG is a trickier process to maintain, but it often lends itself better to a premium product,” says Anton. 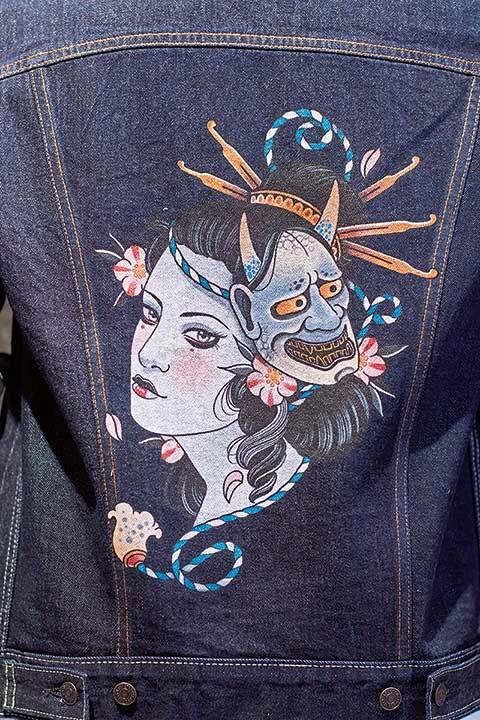 DTG is the technique of choice in the Levi’s store on Regent Street this December. 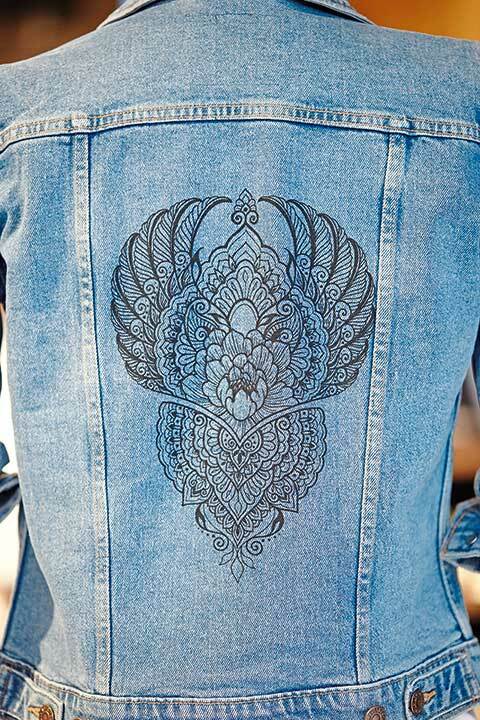 Using a touchscreen kiosk, customers can choose a limited edition design created by one of five leading UK tattoo artists and then have it printed onto a new Trucker Jacket in front of their eyes. 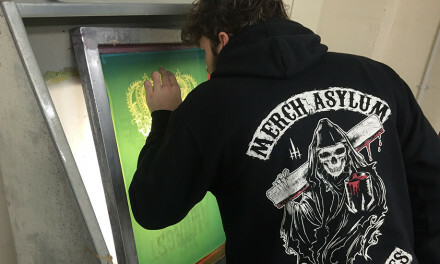 The jacket back prints are produced on a Brother GTX printer, which was installed by MHM Direct GB: the company also provided YR with print training. 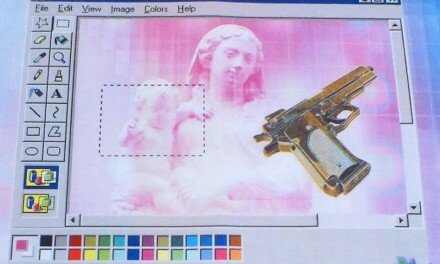 Anton explains that YR chose the GTX because it is the “fastest and most advanced semi-portable printer we have seen,” and comes with good support. The company also prides itself on its software. “It’s fun, interactive, intuitive, immersive, good at data capture, good at increasing dwell time,” says Anton. “Each software we deploy is different and often custom to the client. We aim to gamify the design process and translate designs into a faithful, real-life examples of what’s on screen. It’s all about creating brand love and giving people an experience they will remember and a product they will keep. And the key to YR’s success? “A good team, a sense of humour and lots of hard work,” he concludes.